Next Altenberg. chapel hill. Kirchberg. Klosterberg. Rosenberg and Sonnenberg one of the most common single layer names in Germany. There are also the names Herrenberg. Mr. Berger and Maximiner Herrenberg, Herrenberg is also included in some other names, for example in Deutschherrenberg, Domherrenberg, Graf Beyßel Herrenberg and Kirchherrenberg. The name derives mostly from a former lordly possession. It occurs 44 times in 9 of the 13 growing areas (see last paragraph). The oriented south-southwest to southeast vineyard with 45 to 70% slope covers nearly seven hectares of vineyards on gray slate soil. Plots in the central slope are considered privileged. 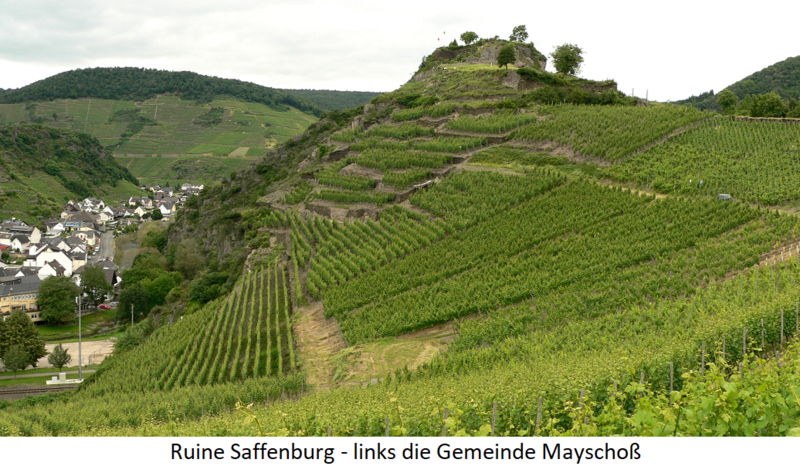 Here, especially the variety Riesling is cultivated. A share of the situation has, for example, the winery Siemens. Other individual layers named Herrenberg exist in the municipalities Alf, Avelsbach, Ayl, Briedern, Cochem (Moselle), Düttingsfeld (Franconia), Enkirch, earth, felt (Mosel), Freyburg (Saale-Unstrut), Gerlachsheim (Baden), Kasel (Mosel), Kenzingen (Baden), Kesten (Moselle), Kleinkarlbach (Pfalz), Kleinochsenfurt (Franconia), Kövenig, Kröv (Mosel), Landau (Palatinate), Leimen (Baden), Mertesdorf (Mosel), Minfeld (Pfalz ), Mutzenroth (Franconia), Niedermennig (Mosel), Nordweil (Baden), Nussdorf (Pfalz), Oberschüpf (Baden), Oberschwarzach (Franconia), Rehborn (Near), Schierstein (Rheingau), Schweich (Mosel), Staudernheim (Nearby ), Trier, Valwig, Wawern and Zell (Mosel). In the two growing areas Franconia and middle Rhine there are also each Großlagen called Herrenberg. This page was last modified at 10 May 2018 at 09:03.